Amy is giving away paper here. 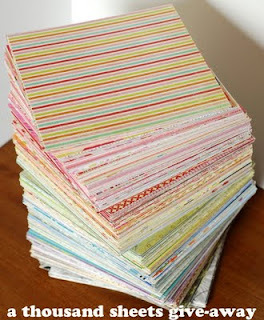 Check out her blog candy and enter to win.... Who doesn't love paper right. Here is a Birthday card I made this weekend I thought it was so adorable when I was done. I did something different and colored him with pencils. I listed him on Ebay tonight also if you are interested. Hope everyone is having a fabulous week just think school starts way too soon. It's been warm here but it's hard to believe its August already. I know it is when I get up for work in the morning at 5am though and it's still dark outside. I hate getting up in the dark it makes it way hard for me to get up. Well have a great evening and remainder of the week. Here is another card I made with my new House Mouse. This one had the cutest saying which was sold out and I need to get that said "Oh Nuts" haha... colored with Copics.